The Beltrán-Leyva Cartel is a Mexican drug cartel and crime syndicate founded by four Beltrán Leyva brothers. The cartel was responsible for cocaine transportation and wholesaling, marijuana production and wholesaling, and heroin production and wholesaling. It controlled numerous drug trafficking corridors, and engaged in human smuggling, money laundering, extortion kidnapping, murder and gun-running.VideoVideo:2012 The Beltran Leyva brothers "The End Of The Cartel"Video: 2011 Edgar Villareal alias La Barbie, a Texas born hitman for the Beltran-Leyva Organization, a powerful cartel which split off from the Sinaloa cartel has since been captured by Mexican federales. His boss, Arturo Beltran-Leyva alias "El Jefe de Jefes" or The Boss of bosses was killed during a Scarface style battle with Mexican navy soldiers in Cuernavaca, Mexico, a gift for the Sinaloa cartel boss Joaquin "El Chapo" Guzman. 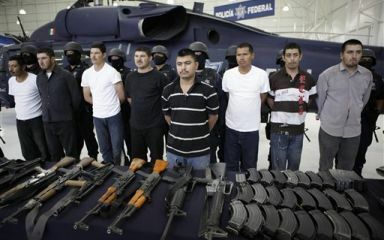 Beltran Leyva Cartel is a group formed c. 2008. It is not known if it's still active.